I really do love a good accent! Last month's feature on aqua accents proved so popular that I was inspired to explore this exciting blue palette even further. Adding a flash of colour is a hugely successful and pretty easy way of updating a room and this is the reason why I fell in love with the 'above' series of eye catching images. This stunning collection demonstrates that smaller accent colours can work just as well as large blocks of the same hue in terms of making an impact, however subtle. I tend to look at accent colours as volume dials, you can turn them up or down depending on how loud you want them to be! 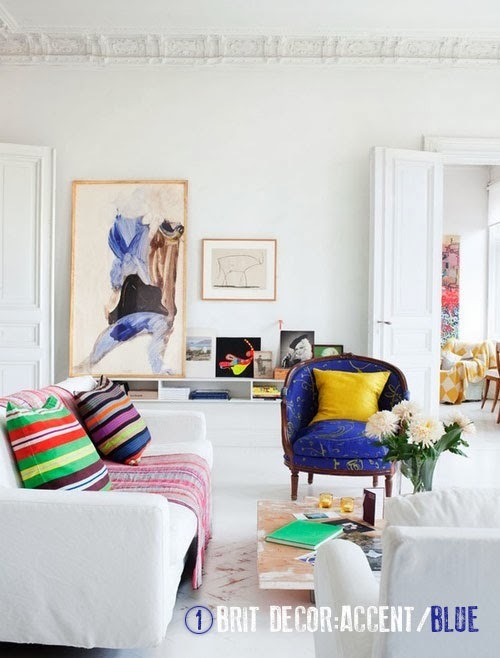 Take for example the inviting royal blue armchair in the first image with its classic blue and gold colour combo and then note how this vivid blue upholstery draws in the beautiful painting behind and the blue stripe of the multicoloured sofa cushion. The 1950's style sofa in image 2 is simply stunning and so on-trend in the smokey petrol blue upholstery, this slightly muted accent colour adds a certain sophistication to the room and happily accommodates the eclectic array of vibrant patterned textiles but this smokey fabric would also work well with moody grey velvet cushions. 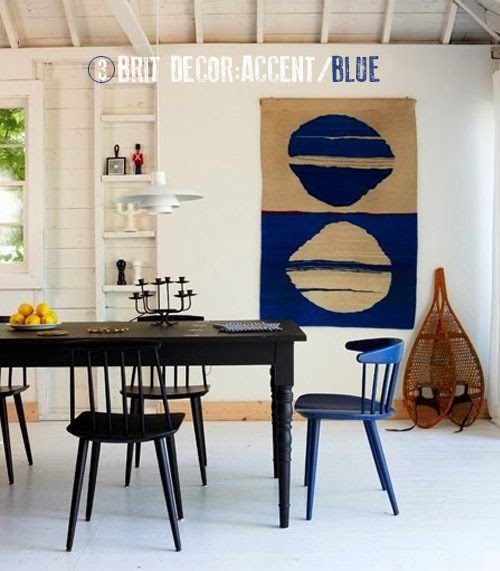 The clever mix of black and blue woodwork in the striking dining room setting in the third image really caught my eye - I love how only one chair has been painted in a sea blue accent, which perfectly partners the textile wallhanging, colour matching is so cool!? 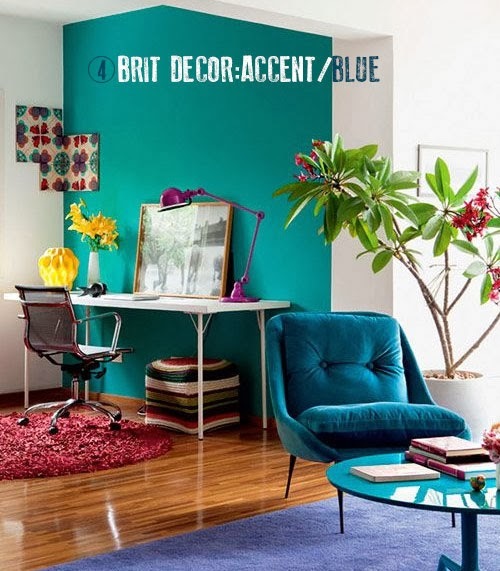 Image 4 delivers a huge burst of colour blocking with this gorgeous emerald blue accent wall colour. A single wall painted in a vibrant colour is guaranteed to make a statement and offers endless opportunities to colour match with accessories like the rich velvet chair and glossy turquoise coffee table. 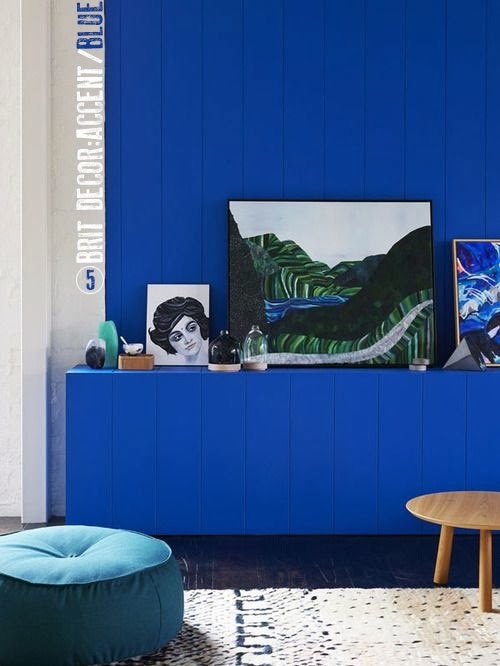 The deep and uplifting Med blue wall panelling and sideboard in image 5 provides a dramatic backdrop for this quirky room. The intensity of this hue means that it's a good idea to counterbalance with some pale neutrals like the rich cream woven rug or the brilliant white wall to the left - the contrast this creates, adds to the drama. In the final image, the colour volume is turned down several notches with dreamy pale pastels (so calming don't you think?) which immediately put me in mind of a restful holiday retreat in foreign climbs. This pale turquoise makes for a beautiful accent sofa fabric and works a treat with the elegant lampshade in co-ordinating colours. 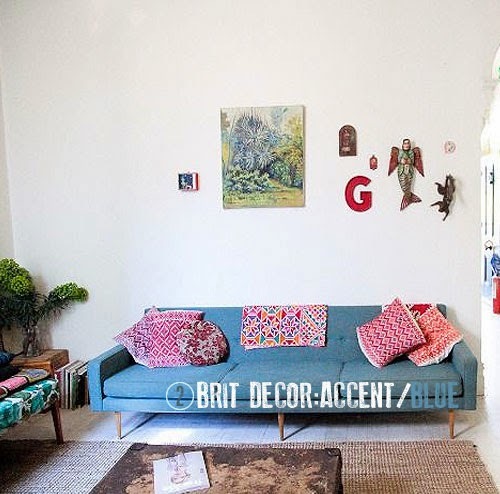 Of course, turquoise isn't the only accent colour at play in this setting with the delicious coral pink cushions and elephant wall print, proof that more than one accent in a scheme can work brilliantly too.